My first scientific project dealt with a DNA minor-groove binder. I was a bachelor student, a fresh member of Pavel's group, and I didn't know any single bash command. Since then, I've studied the DNA double-helix, a piece of HIV-1 untranslated mRNA, and the ribosome. During my masters, I wanted to understand what kinds of noncovalent interactions are responsible for the paradigmatic double-helical shape of DNA. The DNA can't be stabilized by inter-nucleobase hydrogen bonds. You would measure an increase of melting temperature (i.e. higher stability), if you exchanged an adenine-thymine base pair by two aromatic rings, which are unable to form hydrogen bonds (napthalenes, for instance). On the other hand, if you "switch off" stacking interactions (in a computer, of course) between nucleobases, the DNA double-helix breaks down. I took a break during my PhD to return back to the nucleic acids on my Alexander von Humboldt stay focusing on non-coding RNAs. I combined the interests in halogen bonding and nucleic acids. Despite rather good electrostatic situation around NAs, only few low-molecular ligands are known to date to form halogen bonds with NAs. I also contributed to a project of Tom Kubař. Upon certain conditions, the DNA may be ionized on a nucleobase. Such a positive charge (in blue in Figure above) may travel to large distances, so the DNA acts as a nanowire. We studied, what structural changes are induced by such charge transfer. With Helmut, I've been working on large-scale simulations of the prokaryotic ribosome. It is a huge biomachine that produces proteins. The catalytic center is buried deep in the ribosome, so the newly synthesize protein needs to exit throught a tunnel. We've been interested in what is going on in the tunnel. The tunnel is actually highly functional environment that e.g. regulates the speed of translations, facilitates peptide (pre)folding, and acts as a binding site for many antibiotics. The halogen bond is a kind of non-covalent interaction, which involves a halogen atom (e.g. bromine) and a Lewis base (e.g. carbonyl oxygen). It means that if these two guys attract each other, we can speak about a halogen bond between them. There are two major areas, where the interest in halogen bonding has been growing terribly fast: crystal engineering and drug design. I've been involved in research of the halogen bonds with my Ph.D. supervisor Pavel Hobza, but also with Bronka at H-ITS and Alberto at IGBMC. Using quantum chemistry methods I've been investigating into nature and properties of halogen bonds. Further, I developed a molecular mechanical model which mimics an anisotropy of charge distribution around the halogen by a virtual site / ghost atom. Currently, I'm trying to use the model for various drug-design and "drug-understanding" projects. Sigma-holes were discovered (slash described?) in 1992, but at that time nobody called them sigma-holes. The term appeared for the first time in the seminal paper of Tim Clark and coworkers. Interestingly, my Alma mater in Prague played some role in the whole story. 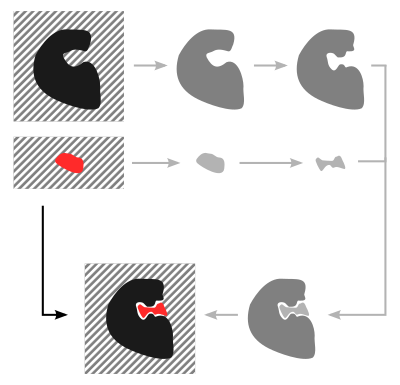 Sigma-holes provide an elegant explanation of some (actually many of) halogen bonding features. The sigma-hole is a region of positive electrostatic potential located on top of halogen atoms. Of course, such a phenomenon have always been existed, but only since 2007 we have this quite matching name. It became so popular thanks to its simplicity - similar reason why lone electron pairs are popular across chemical disciplines. Quantum chemical calculations revealed that the halogen electrons tent to occupy less those orbitals which are aligned with the carbon-halogen covalent bond. A manifestation of this is the positive (or less negative) electrostatic potential on top the halogen. Such a positive region attracts the interacting nucleophile. Eventually, sigma-holes have been identified also of atoms of groups IV, V and VI. Despite an abundance of literature, there has been an ambiguity in describing sigma-holes. We've tried to introduce a systematic nomenclature of such three-dimensional objects. With Pavel Hobza, Paolo Carloni and others we studied symmetric and asymmetries halogenated compounds and provided a set of descriptors of sigma-holes (size, magnitude, deviation from linearity and range). Further, we attempted to relate the sigma-hole properties to halogen bonds. We learned that most of the sigma-holes on chlorine, bromine and iodine are positive. This is non-trivial since sigma-holes might also be negative (but less negative that their surroundings). Also we found a strong correlation between sigma-hole magnitude and size. The more positive the region is, the larger area it has. Some combined theoretical-experimental studies disapproved any relationship between sigma-hole characteristics and biological action of halogenated compounds. In computer-aided drug design, the scoring is an important technique to assess the quality of drug candidates. Often it is based on knowledge of the atomistic structure of the drug-receptor complex. A typical task is to test a lot of drug candidates, scoring must be computationally fast and reliable at the same time. Folks in the lab of Pavel Hobza work on scoring which involves quantum chemical calculations and since my Ph.D. I've had a chance to contribute a bit. The scoring function they designed consists of several terms, which describe various phenomena of a thought decomposition of drug binding. One of the contributions is solvation/desolvation free energy and in magnitude, this is one of the two largest. I've been involved in studies of implicit solvent models, where water is treated as a structureless continuum. An important question which arises from the use of implicit models is what drug conformation is the most relevant. In the case of rigid molecules such as benzene it is simple to answer. On the other hand, flexible molecules are difficult to treat by implicit models and some sort of conformational sampling needs to be employed.